Electronics Packaging Technology Conference (EPTC) is an international event organized by the IEEE Reliability/CPMT/ED Singapore Chapter, sponsored by IEEE CPMT Society in Singapore. It is one of the premier conferences in Asia, with a wide coverage of technological developments in all areas of electronic packaging from design to manufacturing and operation. Since its inauguration in 1997, EPTC has developed into a highly reputed electronics packaging conference in Asia. It is well attended by experts in all aspects related to packaging technology from all over the world. Last year in 2015, we had over 350 attendees, 167 papers, 5 invited papers, 13 invited presentations and almost 35 technical sessions. There were also 6 Professional Development Courses (PDC). EPTC provides a strong platform to demonstrate your technologies and products as well as expand your customer network. 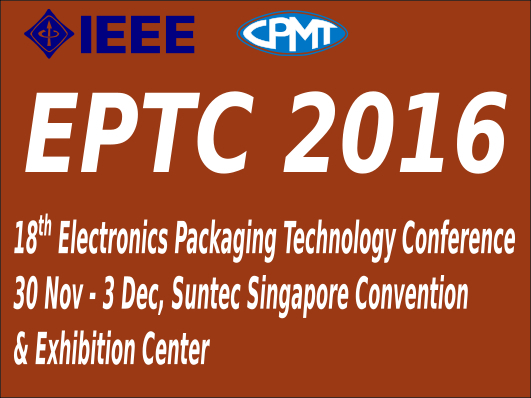 The 18th Electronics Packaging Technology Conference (EPTC 2016) will take place from the 30th November to the 3rd December.